Some impressive components, but can this card stand up to the competition? In theory, the only difference between this cheapo Radeon HD 3850 board and the highfalutin' HD 3870 card from Sapphire is clockspeeds. They both share 320 stream shaders, 16 texture and render output units, 256-bit bus and 512MB of memory. We couldn't help hoping that the large, flower-style copper cooler PowerColor strap-on would help bridge the gap. To an extent, it does. 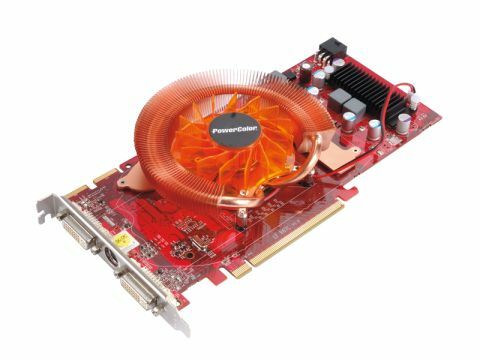 As standard, the GPU on this card runs around 100MHz slower. With both overclocked, that shrinks to just 50MHz. Not enough to be noticeable in-game. So, in other words, why pay more? As for how this card compares to Asus' 8800 GS, it's a little off the pace at stock frequencies, but on par when overclocked. The extra 128MB of memory PowerColor delivers then is significant.